Turquoise and coral bola tie made by Navajo & Zuni Indians in Arizona or New Mexico; photo from Gold Mountain Mining Company (all rights reserved; used by permission). Probably one of the oldest gemstones known, turquoise is an opaque, blue-to-green semiprecious stone. Only the prized robin's egg blue color is used to make gemstones. The majority of the world's finest-quality turquoise comes from western and southwestern United States (the largest producer of turquoise in the world). 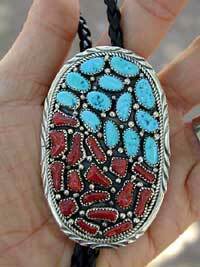 Native Americans of the southwestern United States and Mexico have used turquoise extensively since about 200 BCE to make solid turquoise beads, carvings, and inlaid mosaics. Nearly all important deposits of turquoise are located near copper deposits in arid desert regions of the world.